God's will is for you to be holy, so stay away from all sexual sin. When wildfires swept through Southern California one fall a few years ago, I noticed a photograph in the newspaper of an entire neighborhood that had been leveled by the fires. All that was left were the foundations. In the midst of all the burned, charred rubble stood one house that remained completely untouched, even by smoke. This gleaming white house stood in stark contrast to all of the ruin around it. When asked why his house was left standing when all the others fell, the homeowner explained how he had taken great care to make his house flame-retardant. This included double-paned windows, thick stucco walls, sealed eaves, concrete tile, and abundant insulation. Firefighters said, "It made it clear to us that this would be a place to make a stand." This man went the extra mile, and as a result, his house survived when the fires came. Satan, a master arsonist, is causing massive devastation today. Our country is being devastated by the wildfires of immorality. It destroys homes. It devastates families. And if we aren't careful, we could become its next victims. The writer of Proverbs asked, "Can a man scoop a flame into his lap and not have his clothes catch on fire?" (6:27 NLT). The answer is no. Fire can burn out of control so easily. If we as believers allow temptation to infiltrate our lives and allow our sinful natures to prevail, we could fall, as surely as a fire spreads by putting gasoline on it. But if we take practical steps to guard ourselves and to stay close to the Lord, then we don't have to fall. Let's go the extra mile to protect our homes and our lives against the wildfires of immorality. This devotional from Pastor Greg really touched my heart today. I have seen this happening in so many families. When they aren't anchored in the Word Satan has a chance to slip in there and add a little gas to the fires so that they become infernos. 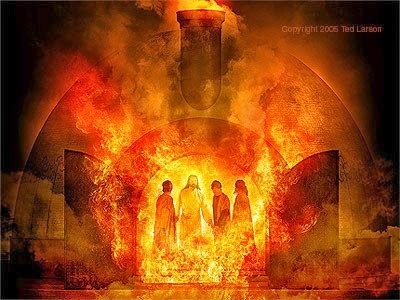 Stay close to the Lord Jesus in these last days so that when the fires come you can stand strong with Jesus who is ready to help us through any fiery trials just like He did with Shadrach, Meshach, and Abednego in the furnace that was turned up seven times hotter. Have a Simply Heavenly day!!! God bless you!! !